The 15 Most Romantic Places in Iowa! While some consider quiet walks in nature their ideal romantic date, others might be looking for a dreamy getaway at a beautiful resort. No matter your preference, Iowa can help you find what you’re looking for. Get ready to share a special experience with the one you love and check out these 15 most romantic places in Iowa. If you are looking for a romantic spot to stay the weekend, not only does Fillenwarth Beach Resort lend access to the attractions of West Lake Okoboji, including dozens of lake-side restaurants and shopping options, but with the beach-front accommodations at Fillenwarth, the scene is perfectly set for a romantic time. No matter the beach you stay on at Fillenwarth, it’s not just the various water activities and fun to be had that makes Fillenwarth ultra-romantic, but it’s the amazing sunsets that you and your other special someone can enjoy that make this resort a romantic reminder of all the good things in life. Known as one of the best wedding venues in Ames, Reiman Gardens is a romantic spot to visit any time of the year and provides the tranquility that’s a perfect setting for a romantic time. Whether it’s a mid-afternoon date in the Christina Reiman Butterfly Wing, or an evening stroll amidst the Jones Rose Garden, Reiman Gardens can provide that perfect spot to spend time with that special someone. 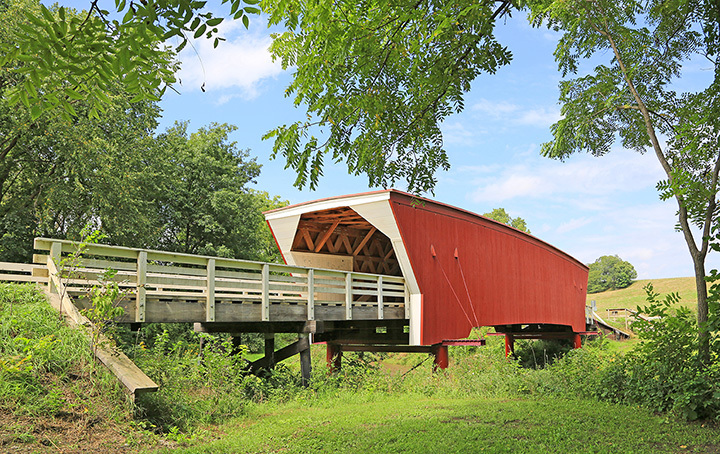 The Bridges of Madison County has already spawned a romantic best-selling novel of the same name, but well before the “Bridges of Madison County” was published in 1992, these historic landmarks have provided a romantic spot for couples to spend time together. It’s hard to name exactly what makes the bridges so aesthetically pleasing, and perhaps it’s just the way these man-made objects have remained the same after weathering so many years of storms, but with your visit to the Bridges of Madison County, you can see for yourself why it’s a good place to bring along someone that can weather the same storms with you. Take a moment to get away from it all at the Lake of Three Fires State Park in southern Iowa. While pitching a tent and washing off in the lake is an option for parts of the year, the three different cabins available for rent at Lake of Three Fires provide a great opportunity year round for a romantic getaway. Whether you spend your day enjoying the trails and natural areas of this awesome State Park, or you stick it close to the cabin and enjoy some distraction-free time with that person you care most about, either way you’ll find these cabins to be the perfect place to make some memories to last a lifetime. The Hotel Pattee in Perry has a lot to offer inside and out of there elegantly decorated rooms. In the surrounding town of Perry, you can find many establishments tuned for romantic interests, including cozy restaurants and a welcoming community, but it’s the hotel itself that turns your ordinary weekend retreat into a romantic one. Featuring individually decorated and themed rooms, with particular attention to the historic sons and daughters of the Midwest, the architecture and surrounding atmosphere of the Hotel Pattee can help set the mood for any occasion. With a rotating blooming schedule for all the plants in the Greater Des Moines Botanical Garden, each visit to this Des Moines institution can feel like the first time. Whether you explore what’s in flower at the conservatory, or you stroll through the intricately landscaped outdoor garden, it’s not just the sights and smells that make this botanical garden a romantic spot to visit, it’s the calm atmosphere amidst Iowa’s biggest city that really sets the tone for a lovely time. Make yourself cozy in the front seat next to your date and enjoy a movie courtesy of Valle Drive-In movie theater in Newton. Serving as Iowa’s oldest and remaining few drive-in movie theaters, Valle Drive-In plays the latest movies you’d find in indoor theaters, and provides the perfect spot to fold up the cup holders and snuggle up close for the most recent screenings. While there are a lot of romantic restaurants in the state of Iowa, Vino’s Ristorante always seems to stand above the rest. Perhaps it’s the fine-dining menu they offer including appetizing selections like spicy penne a la vodka or shrimp florentine, or perhaps it’s the brimming wine and cocktail selection, but what will probably make your next date at Vino’s really romantic is the cozy, soft-lit surroundings that accompany your meal and beverage choice. For those adventure-inclined couples out there, the Loess Hills State Forest offers the perfect romantic spot for hiking and exploring together. Within the 11,000 plus acres that comprise the Loess Hills State Forest you can expect to find an abundance of prairie grass, trails to meander and overlooks that can really set the mood. Within your trip to the Loess Hills State Forest, it’s worth visiting Preparation Canyon State Park and perhaps pitching a tent to spend a night in the great outdoors with your better half. While dinner might be the first thing to come to mind when referring to a romantic meal, brunch the Iowa River Power Restaurant might change your mind forever. Add in a couple of signature mimosas and it’s easy to see why this Iowa-renowned brunch is all that it is cracked up to be. Whether it’s the start to a romantic day with your partner in crime, or it’s the cap to a special weekend getaway, the brunch selection and seating arrangements at Iowa River Power Restaurant will leave you feeling satisfied and happy. Family-owned and operated, the Santa Maria Vineyard and Winery offers the perfect combination of food, drink and aesthetics to create the perfect romantic getaway. Whether you are in the mood for a wood-fired pizza or an in-house red, Santa Maria Vineyard and Winery couples all their menu options with a warm tasting room and sprawling rows of Iowa grapes, making a trip to this Vineyard one to remember. For an interesting exploration into another culture, nothing in Iowa is quite as unique as the Historical Village of Pella. Filled with the Dutch ancestry that gives Pella its flair, the Historical Village includes the Vermeer Windmill, the Scholte House Museum and the historic Amsterdam School House, which are all perfect places to spend a weekend exploring with that special someone. Outside of its usual attractions, the Pella Historical Village also hosts plenty of special events that cater towards a good time, but all you really need to have a romantic time in Pella is your own two feet and someone special to share it with. First constructed in 1923, the Butler House on Grand provides its guests with a taste of old Des Moines while catering towards all the amenities the modern city features. All seven of the available rooms in the Butler House are carefully and individually decorated with a touch of class, and the surrounding premises that this cozy bed and breakfast provides adds a lot of aesthetics to your stay, making the hardest decision when visiting the Butler House on Grand is whether you want to leave the grounds and explore the vibrant Des Moines streets during your stay. For a romantic night out at the theater, nothing quite stacks up like the Orpheum Theater of Sioux City. Nestled close to the Iowa/Nebraska border, the Orpheum Theater includes antique chandeliers that hang proudly in the lobby, restored architecture that reflects its 1920s construction, an atmosphere of time’s past and of course a spacious auditorium to see your favorite acts, all making for your next visit to the Orpheum Theater to be a special one no matter the show you are catching. For a memorable and low-cost date opportunity, the Brenton Arboretum in Dallas Center offers free admission and over 2,000 different trees to stroll past. Featuring enough fresh air and wild spaces to explore all day long, the Brenton Arboretum can produce healthy memories with someone special on a self-guided tour or by watching migratory birds fly by. Even if you’re not that interested in trees, it’s the perfect place to spend some alone time with anyone close to your heart.